There was a time in which I read a lot of detective novels. British and Scandinavian ones were always my favourite. For some reason I've digressed from them lately, but I'm planning on reading more of them again. 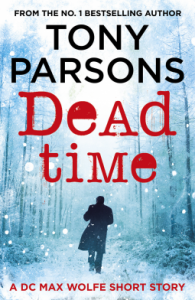 This short DC Max Wolfe story was a nice introduction to author Tony Parsons. I haven't read any of his other stories, but perhaps I should have. A lot happens in this story, and it was hard for me to keep track of all the persons I was still unfamiliar with and everything that was happening all at once. I completely understand that only so much can be told in about 60 pages, but some times, and also in this case, I think it should have been better if a bit fewer things happened, so there could have been a bit more detail. However, the story was very interesting and I'm planning on reading other novels in this series. In my plan to pick up the detective genre again, this series will definitely be on my list. Even if only to see if a full length novel feels less rushed. Dead Time is a short story in the DC Max Wolfe series. Other books in this series are The Murder Bag and The Slaughter Man.